Morris L. Goodman was born in Baveria in 1819. Morris Goodman became a U.S. Citizen in Cincinnati in 1843. From there, he moved to New York for a short spell before coming to Los Angeles in 1849 to become a dry goods merchant. In the first American Census of 1850, Morris L. Goodman was one of the eight Jews in Los Angeles, all living and merchandising in Bell’s Row at the corner of Aliso and Los Angeles Streets. He learned Spanish rapidly in order to do business with most locals. His partners in his store were two other pioneer Jews from Germany, Joseph Plumer and Philip Michael. The following year Goodman was running the store by himself. Goodman also invested in Los Angeles properties in those early days. He owned five lots on Spring Street and on Broadway. He was a partner in a property investment company, Rimpau, Fritze & Co. In 1871, Morris L. Goodwin led a group of German immigrants, which included Theodore Rimpau, to settle a new town to be called Anaheim, in an area that would eventually become known as Orange County. Morris Goodman later moved to La Ballona Valley, today known as Culver City and Palms. There, he became a ranchero instead of a businessman, as listed in the U.S. Census. When the first Common Council of Los Angeles was sworn in during 1850, Morris L. Goodman was one of the first seven citizens to serve. This early Council set up the first city school and the police department. Goodman lead both committees. In 1856, he was appointed U.S. Deputy Marshall, as well as a member of the County Grand Jury. With the founding of the Los Angeles Board of Supervisors in 1860, two of the five Supervisors were Jewish, Morris L. Goodman and Julius Morris. 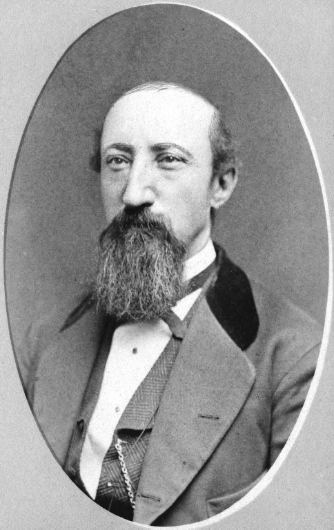 In 1858, Morris L. Goodman was chosen as Chairman of the Los Angeles Delegation to the District Convention of the Democratic Party. In 1853, Goodman was a Charter Member of the Masonic Lodge #42 of Los Angeles. He had become a Mason during his stay in New York. in 1855, Goodman organized and became the first President of Los Angeles Lodge #35 of the International Order of Odd Fellows. 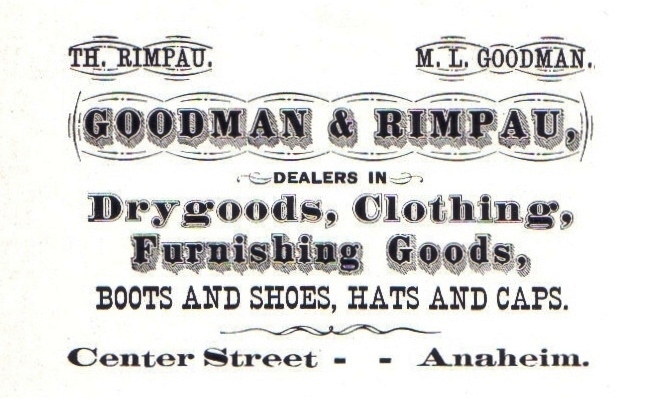 Morris L. Goodwin briefly left California in 1871 to seek his fortune in Arizona, but returned to California in 1872, where he set up a dry goods and clothing store in Anaheim. 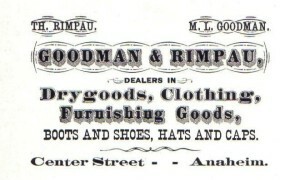 He joined together with his old business associate, Theodore Rimpau to create Goodman & Rimpau. Goodman was the senior partner and a gifted buyer. He would travel to San Francisco in the Spring and Fall to buy merchandise for the coming season. Morris Goodman retired in 1886 and died in 1888. William M. Kramer and Norton B. Stern, “Morris L. Goodman: Los Angeles’ First ‘American’ Councilman – 1850,” Western States Jewish History 34/3&4.